What is the Snoozer Outlast® Dog Bed Sleep System - 5 Inch Foam? The Snoozer Outlast® Dog Bed Sleep System - 5 Inch Foam is a comfortable bed for pets of all ages, especially older pets. It's made with 5", high-density foam and covered with a luxurious microsuede that comes in three different color options. The Snoozer Outlast® Dog Bed Sleep System - 5 Inch Foam contains Outlast® technology, to keep your pet from getting too hot or too cold; plus, an odor eliminating fabric insert. The 5 inch foam keeps pets off the ground and warm or cool during any month of the year. The Snoozer Outlast® Dog Bed Sleep System - 5 Inch Foam combines Outlast® Heat management technology, Odor Audios, an odor eliminating fabric insert, and high density 5" convoluted foam to provide your pet with ultimate comfort. Outlast® heat management technology was developed by NASA to manage the buildup of heat by mitigating temperature swings to balance your pet's temperature levels, and the Odor Audios helps keep the bed odor free. It comes with a removable and washable microsuede cover that most pets love the feel of, and 4 different sizes to meet your pet's needs, (see sizing options on "Size" tab). As an added bonus, the Snoozer Outlast® Dog Bed Sleep System - 5 Inch Foam is available in 3 different color options to match most home decor. Snoozer Outlast® Dog Bed Sleep System - 5 Inch Foam keeps your pet up off the floor during bedtime or naptime. Senior pets benefit from the 5" thick foam because it is easy on the joints. Both the cover and the fabric insert are machine washable. 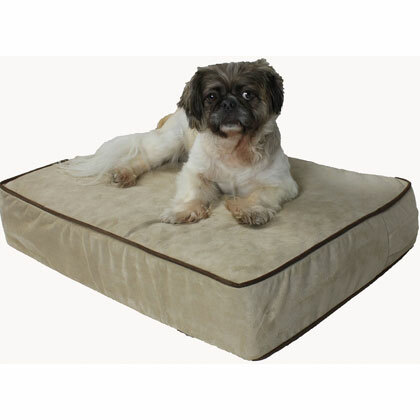 Allow your pet to rest or sleep on the Snoozer Outlast® Dog Bed Sleep System - 5 Inch Foam at anytime. 15" x 22 "x 5"
18" x 26" x 5"
23" x 36" x 5"
26" x 42" x 5"